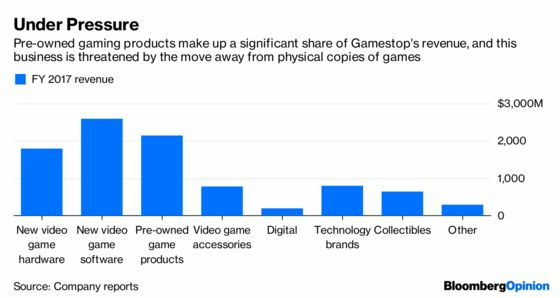 (Bloomberg Opinion) -- It’s game over for GameStop Corp.’s attempt to sell itself, and I can’t say I’m surprised. On Tuesday, the video-game retailer said it had terminated efforts to find a buyer because financing was unavailable at terms that acquirers would find acceptable, sending the shares tumbling more than 27 percent. But why a would-be buyer or lender would want to even get near this thing is beyond me. After all, the video gaming world is undergoing a rapid structural shift away from physical copies of games toward digital downloads and streaming. This is a key reason why short sellers have been piling into the company for years. It’s not that GameStop is unaware of the changing dynamics. It has aimed to diversify its business, such as with its ThinkGeek collectibles store. But the fact remains that the company is still deeply dependent on a category that is destined to fade into oblivion. Not only is GameStop’s video-game division under siege because of this shift, so is its sizeable pre-owned division, which earns fat profit margins. 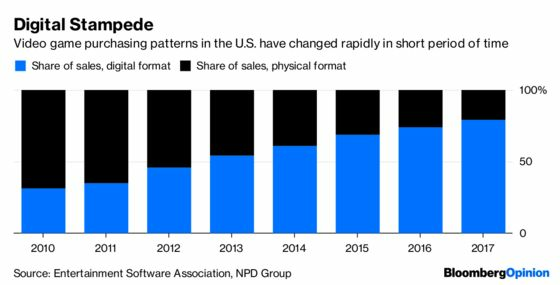 As Bloomberg Intelligence analyst Matthew Kanterman points out, this trade-in business is bound to struggle with inventory problems as consumers migrate away from physical copies of games. Meanwhile, other uncertainties hover over GameStop. The company just sold off its Spring Mobile division for $700 million. That provides a welcome cash infusion, to be sure, but it sends mixed signals about its overarching strategy. By dumping that business, which operates AT&T wireless stores, didn’t it just make itself even more dependent on the video-game segment? Plus, the company has had instability in its highest ranks. Michael Mauler was named CEO last February, only to depart after just three months on the job. The retailer has been led by an interim chief executive since then. Mauler’s departure came not long after the company terminated the employment of Chief Operating Officer Tony Bartel and Mike Hogan, a senior executive overseeing strategic business and brand development. Without a take-private deal, GameStop still has levers it can pull to become a healthier company. Executives could take an ax to its bloated store portfolio, which wouldn’t be especially hard to do. CFO Robert Lloyd said on a call with analysts in November that the average lease life remaining for its video game stores is less than two years. Those expirations provide easy exit ramps for under-performing stores. Also, potential innovation in consoles from the likes of Nintendo Co. and Sony Corp. could provide a sales and traffic jolt at some point down the line. In a way, it’s kind of astonishing GameStop has hung on as long as it has in its current form. 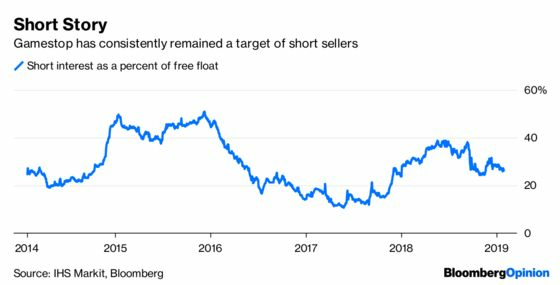 As far back as November 2011, my colleague Tara Lachapelle was writing about speculation that GameStop was a ripe LBO opportunity, even as it was targeted by the shorts. That leaves me both cringing at the fact that GameStop has been stuck in the same storyline for so long, and also oddly impressed that it has been scrappy enough to not go the way of Blockbuster or Tower Records. It will be up to GameStop’s next CEO to somehow retain the grit but rewrite the corporate narrative.